Obesity is a result of excess body fat accumulation, which often causes adverse effects on human health, such as cardiovascular diseases, type 2 diabetes mellitus, and cancer. Depending on suspected etiology, obesity is commonly classified into three subgroups: monogenic, syndromic, and polygenic or common obesity . Incidence of obesity has dramatically increased over the past few decades and is a global health problem worldwide. In particular, polygenic obesity depends on an individual's genetic makeup that is susceptible to an environment that promotes energy consumption over energy expenditure. As such, search for genes associated with polygenic obesity has focused on multiple interacting alleles contributing to common diseases. Major approaches used to identify novel gene variants associated with polygenic obesity, include candidate gene, genome-wide linkage and genome-wide association studies . Genes that define polygenic obesity have been implicated in a wide variety of biological functions, such as the regulation of food intake, energy expenditure, lipid and glucose metabolism, and adipose tissue development . There is growing evidence for a relationship between obesity-associated insulin resistance and mitochondrial dysfunction . Characterization of genes responsible for increased fat deposition is needed to develop methods and tools that can identify people at high risk for obesity. This information can also be used to design appropriate targeted therapies that will improve the quality of care of obesity-linked conditions . The identification of obesity candidate loci is also attractive for animal breeding, due to growing consumer demand for products with lower fat content. On the other hand, selection of animals with superior marbling or intramuscular fat (IMF) phenotypes is an important objective for livestock producers since meat with a high marbling content tends to be juicier and is more tender and flavorful than very lean meat . The rapid development of molecular genetic marker technology in recent years has led to the identification of genes that contribute to the genetic variation (so called quantitative trait loci, QTL) of marbling or IMF content in livestock species, and hence to molecular farming by marker-assisted selection [7, 8]. Therefore, the same orthologous genes may have conserved functions in biological or biochemical pathways, and thus explain the same or similar variations of the concordant QTL among different species . Comparative approach may reveal novel candidate genes and functional insights into obesity in human . In a previous study, we collected over 2,000 reports on genes/markers affecting fat phenotypes in several species , assigned them to the human orthologous regions and subsequently used the markers for identification of genetic networks associated with various fat and fat-related phenotypes in a Wagyu x Limousin cattle population . Recent discoveries also link the development of obesity to microRNAs (miRNAs) . MiRNAs regulate expression of most genes and play critical roles in different biological processes, such as cell differentiation, proliferation, death, metabolism, and energy homeostasis . Some miRNAs have also been implicated in regulation of adipogenic differentiation [14-27]. These data strongly suggest that miRNAs represent a new class of adipogenic inhibitors that may play a role in the pathological development of obesity . The human obesity gene map was updated yearly from 1996 to 2006 and published in the journal Obesity (previously, Obesity Research). This map displayed gene/marker information associated with obesity and obesity-related phenotypes using data collected from a variety of sources, such as PubMed using a combination of key words, authors, and journals; continuous reviews of obesity and genetics journals; personal collection of reprints; and papers made available to the authors by colleagues around the world . Although the yearly review was a valuable tool for researchers involved in this field, it was discontinued after 2006. However, an increasing number of studies have been published on obesity and adipogenesis in human as well as in other animals. The aim of the present study was, therefore, to assemble all available information associated with fat deposition into a publicly available online obesity database. We collected data with obesity associated genomic loci from different sources and species (human, cattle, rat, and mice) in an obesity gene atlas, which includes a database and genomic views. We believe that this database will serve as a valuable source for fine mapping and narrowing QTL regions to a few genes and identification of major pathways involved in obesity. In order to integrate data from different sources, a holistic (map-driven) approach was used and an interactive genomic view of collected obesity candidate loci was developed. The map-based approach reveals positional overlaps between candidate loci, thus allowing complementation of different pieces of information from various species for cloning of positional candidate genes. 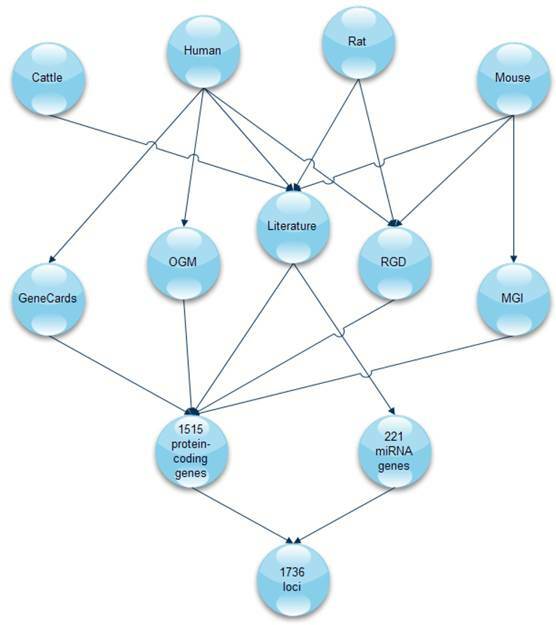 Obesity associated candidate loci identified in human, cattle, rat, and mice were collected from literature and publicly available databases. All relevant publications were identified after searching PubMed (http://www.ncbi.nlm.nih.gov/pubmed) and Web of Science (http://apps.webofknowledge.com/), with key phrases, such as gene, genetics, epigenetics, non-coding RNA, microRNA, obesity, adipose tissue, marbling, fat deposition, adipogenesis, human, cattle, rat, and mouse. Obesity-associated loci were also extracted from the following databases: Human obesity gene map (OGM) , GeneCards, version 3.07 (http://www.genecards.org), Mouse Genome Informatics, release 4.42 (MGI: http://www.informatics.jax.org). To analyze genomic overlaps of obesity associated loci, QTL were downloaded from Rat Genome Database, release date: October 2011 (RGD: http://rgd.mcw.edu/) , and Animal QTL Database, release 15 (http://www.animalgenome.org/cgi-bin/QTLdb/index/). QTL associated with obese phenotypes were selected (body fat, body weight, adiposity, obesity, and diabetes) for cattle, mouse, and human. Gene nomenclature was based on the HUGO Gene Nomenclature Guidelines (http://www.genenames.org). MiRNA nomenclature was adjusted according to the miRBase, release 18 (http://microrna.sanger.ac.uk/). Ingenuity Pathway Analysis (IPA: Ingenuity Systems® www.ingenuity.com) was used to interpret the obesity candidate genes in the context of biological processes and pathways. The Ingenuity Knowledge Base contains information from databases including: Gene Ontology, Entrez Gene, RefSeq, OMIM, KEGG metabolic pathway information etc. (www.ingenuity.com). IPA analysis was performed twice, once with protein coding genes and miRNAs and the second time only with protein coding genes. Genomic views (graphical overview of the chromosomal locations) of obesity associated loci were constructed using the web-based interactive visualization tool Flash GViewer (http://gmod.org/wiki/Flashgviewer/) developed by the GMOD project. Previous studies have confirmed a large number of genetic loci associated with obesity and adipogenesis in mammals. We retrieved data from the literature and publicly available databases (PubMed, Web of Science, OGM, GeneCards, MGI, and RGD) for 1,515 protein-coding genes and 221 miRNAs in four different species (human, cattle, rat, and mouse). The workflow of data collection is presented in Figure 1. The workflow of data collection. A total of 1,736 loci were retrieved from five databases and current literature for four mammalian species (Rat, Human, Cattle, and Mouse). Genes and miRNAs associated with adipogenesis were retrieved from literature, OGM, Gene Cards, MGI, and RGD. OGM: Obesity gene map, RGD: Rat genome database, MGI: Mouse genome informatics database. As early as in 2004, miRNAs were identified to play regulatory roles in adipocyte differentiation . Since then, 221 miRNAs have been found to be expressed or disregulated in adipose tissue or adipocytes in human, cattle, rat, and mouse. Those miRNAs were collected in studies using 3T3-L1 pre-adipocytes, adipocytes, adipogenesis, adipose tissue, back fat, diabetes, omental fat and subcutaneous fat, and obesity (Figure 2) [14-27]. As shown on a Venn diagram (Figure 3), some miRNAs have been found to be associated with fat deposition in more than one species. For example, 14 miRNAs (let-7a, let-7b, let-7c, let-7e, let-7f, mir-103, mir-10b, mir-125a, mir-125b, mir-143, mir-23a, mir-23b, mir-26a, and mir-99b) have been reported to affect fat deposition in all four species. Interestingly, Wang et al. also described involvement of mir-143 in regulation of porcine adipocyte lipid metabolism, which indicates its strong impact on adipogenesis. (A) MiRNAs associated with 3T3-L1 pre-adipocytes, adipocytes, adipogenesis, adipose tissue, back fat, diabetes, omental fat and subcutaneous fat, and obesity retrieved from current literature. An example for miRNA let-7b associated with five obesity-associated traits is shown in red. (B) Close up of miRNAs with regulatory roles in obesity-associated traits. (C) MiRNAs associated with back fat. 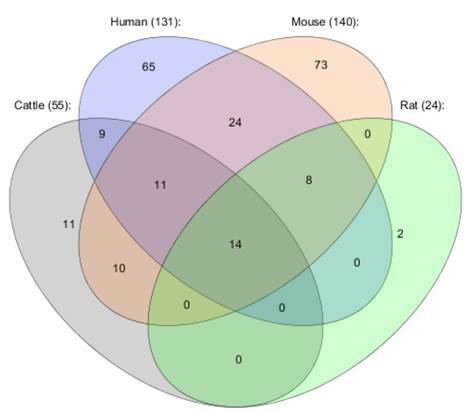 Venn diagram presenting common obesity miRNAs for four species: cattle, human, mouse, and rat. Based on the data collected from four mammalian species: human, mouse, rat, and cattle, we created an online database to share the information with the community on genetics and genomics of fat deposition/obesity. The database consists of 1,736 obesity-associated loci, including 1,515 protein-coding genes and 221 miRNAs. The database is freely available on the Web site at http://www.integratomics-time.com/fat_deposition. In order to further strengthen the community's involvement in the database expansion and utilization, we also generated an online data entry interface, which will enable users to update or submit new obesity-associated candidate genes and markers. The newly submitted information will be reviewed by curators before releasing to the public (http://www.integratomics-time.com/fat_deposition/add_genes). The centralized database on genes/markers associated with obesity and adipogenesis will provide fundamental information on what genetic loci are involved in obesity-related traits, how their effects are similar or different among different species and how they interact under different conditions. The knowledge generated from the genetics/genomics studies will provide insight into the molecular basis of obesity and allow for prospective identification of people who have a genetic predisposition to become overweight and/or obese. We believe that the newly constructed database will advance us to the forefront of mapping of QTL for complex traits and understanding their biological pathways by combining a traditional quantitative genetics approach with a modern molecular genetics approach. More importantly, the information obtained in the present study will offer potential and exciting possibilities for future development of successful therapies and new treatments for obesity in humans. On the other hand, due to growing consumer demand for products with lower fat content, an important objective in animal breeding is to improve meat quality traits. Therefore, addition of data related to livestock animal models in our database will have implications in agriculture and biomedicine. An integrative, comparative-genomics approach allowed us to join obesity-associated information for various species regardless of the study approach, and to present collected loci from human and animals in the form of a single species (human, mouse, and cattle) genomic view available at http://www.integratomics-time.com/fat_deposition/genomic_view/. Genomic view of obesity-associated loci is visible through Flash GViewer provided by the GMOD consortium. Human obesity associated orthologous protein-coding genes, miRNA genes and overlapping QTL are shown in Figure 4. Additionally, a large number of obesity QTL have been identified in domestic and model animal species. To analyze genomic overlaps of obesity associated loci, QTL for cattle, mouse, and human were downloaded from AnimalQTLdb and RGD. QTL associated with obese phenotype were selected: 469 in human, 355 in cattle and 274 in mouse. Genomic overlap analysis was performed comparing the location of obesity QTL, protein-coding and miRNA genes. Obesity associated orthologs overlapped with 222 human, 176 cattle, and 38 mouse QTL, respectively. Some candidate genes overlapped with a high number of QTL and therefore could potentially be stronger molecular markers. Three human obesity candidate genes: CEBPB (CCAAT/enhancer binding protein (C/EBP), beta), PTPN1 (protein tyrosine phosphatase, non-receptor type 1), and SLPI (secretory leukocyte peptidase inhibitor) each overlapped with 11 different QTL. Gene ALB (albumin) overlapped with 16 QTL in cattle. Similarly, using integratomics approach, Kunej et al. identified a molecular marker residing within the mmu-mir-717 gene, growth rate associated gene Gpc3, and growth associated QTL. Several studies have also shown that protein-coding host genes are functionally linked with their resident miRNAs [23, 30]. MiRNA genes and their sense oriented host genes can be transcribed from shared promoters , whereas antisense orientation suggested that miRNAs and host genes have independent transcription mechanisms . Our analysis showed that among 221 obesity-associated miRNAs, 54 resided within human and 57 within mouse host genes, including some of non-protein-coding genes; large intergenic non-coding RNAs (lincRNAs) (Supplementary Material: Table S1). Sense oriented obesity associated miRNA genes from our obesity database overlapped with introns (39 in human and mouse), exons (eight in human and nine in mouse), or 3'-UTRs (two in mouse) of their host genes. Interestingly, three of the host genes have been previously associated with obesity: mir-335 resided within host gene MEST (mesoderm specific transcript homolog (mouse)) in human and mouse, mir-378 within Ppargc1b (peroxisome proliferator-activated receptor gamma, coactivator 1 beta), and mir-33 within Srebf2 (sterol regulatory element binding transcription factor 2). In addition to these three miRNA-host gene pairs, other miRNA-host gene pairs warrant further experimental analyses to explore their potential functional link. Comparative genomics allowed exploitation of animal models for elucidation of obesity phenotype in human. However, extrapolating the gained knowledge from one species to another is often difficult, due to different anatomical and physiological characteristics. Similarly, integratomic/genomic overlap approach was already successfully used for identification of candidate loci for mammary gland associated phenotypes  and male infertility . Human chromosomes with obesity-associated loci. Genomic view of the obesity-associated candidate loci presented as human orthologs. Enlargement of the chromosome 21 is showing an overlap between QTL for body weight (BW276_H) and seven obesity related loci ADAMTS1, APP, GABPA, HSPA13, LIPI, NRIP1, and hsa-mir-99a. Human orthologs of obesity candidate genes were integrated into interactome networks using Ingenuity Pathway Analysis (IPA) (Figure 5). 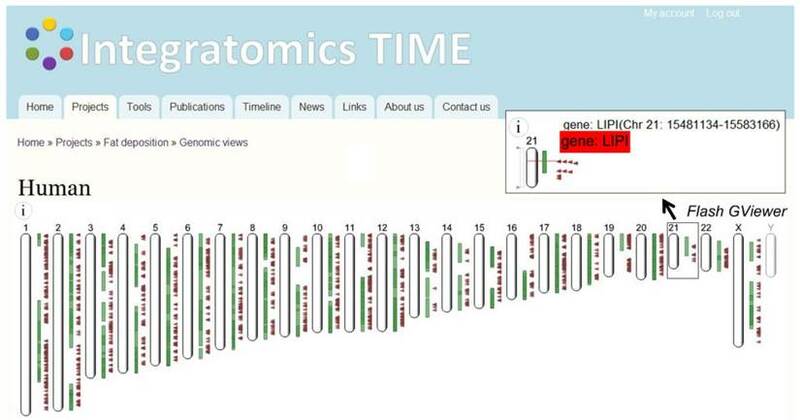 Input data set consisted of 1,676 genes (protein coding and miRNA genes) and can be accessed on the web page http://www.integratomics-time.com/fat_deposition/genomic_view/. 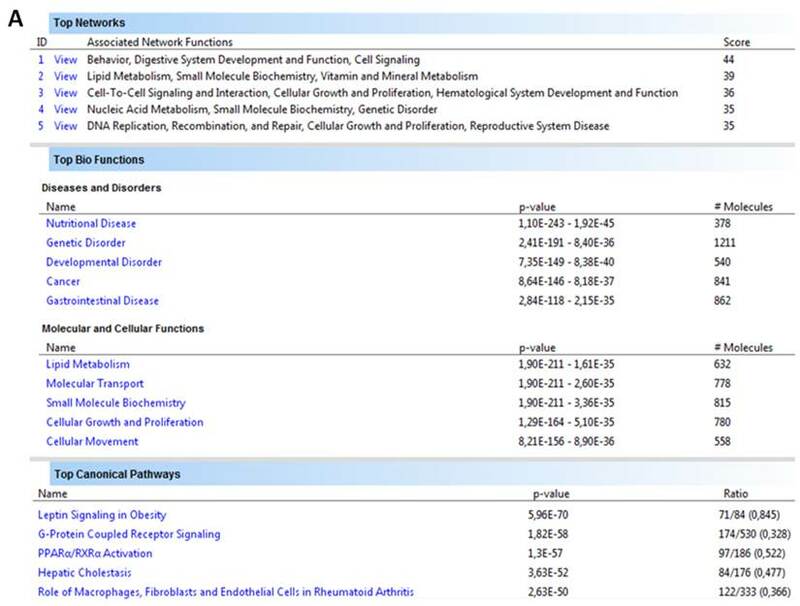 Five of the highest scored networks, diseases and disorders, molecular and cellular functions, as well as canonical pathways are shown in Figure 5a. The analysis revealed that obesity candidate genes were associated with nutritional disease, genetic, gastrointestinal, developmental disorder, and cancer. From the total of 25 top networks four of them were found to be associated with lipid metabolism (data not shown). A merged diagram of these four networks includes 140 obesity candidate genes and 175 molecules (Figure 5b, Supplementary Material: Table S2). Peroxisome proliferator-activated receptor alpha (PPARα) and retinoid X receptor alpha (RXRα) were identified as central nodes, also called hub molecules. Peroxisome proliferator-activated receptors (PPARs) are nuclear hormone receptors that regulate genes in energy metabolism. Activity of PPARs is dependent on RXR biological activity; PPARs require cognate lipid ligands, heterodimerization with retinoic X receptors (RXR) and coactivation by coactivators . The PPAR-RXR transcriptional complex plays a critical role in energy balance, including triglyceride metabolism, fatty acid handling and storage, and glucose homeostasis: processes whose dysregulation characterize obesity, diabetes, and atherosclerosis . Interestingly, our network analysis of obesity associated genes identifies both of them as central nodes. Moreover, the PPARα/RXRα activation pathway was one of the top five canonical pathways identified using IPA analysis. 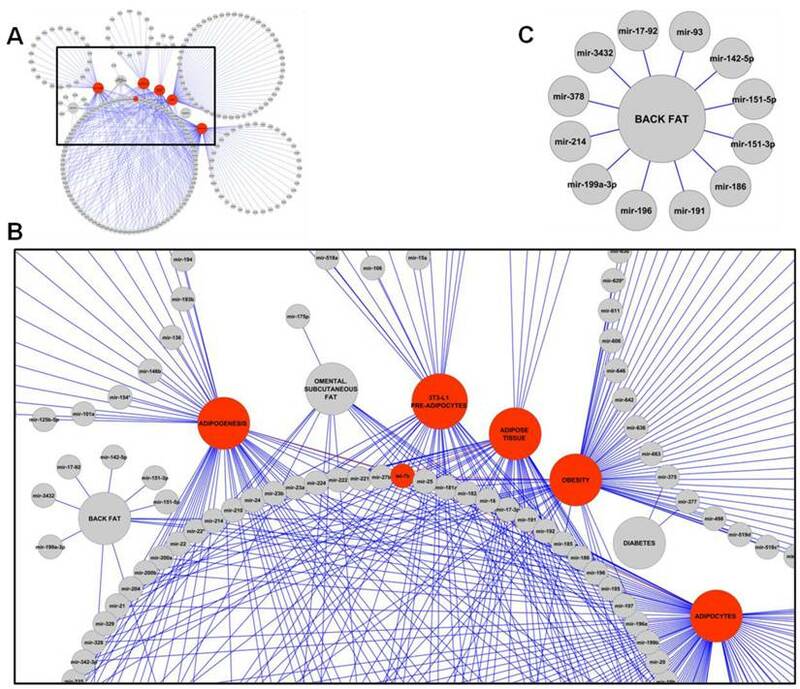 Association of human orthologs of obesity genes with molecular networks, biological functions and canonical pathways according to Ingenuity Pathway Analysis software. The information contained in Canonical Pathways comes from specific journal articles, review articles, text books, and KEGG Ligand (www.ingenuity.com). (A) Five top networks, biological functions and canonical pathways. (B) Pathway analysis of obesity associated loci, shown as diagram of a molecular network associated with lipid metabolism. A network close-up including central nodes PPARα and RXRα is shown on the right. 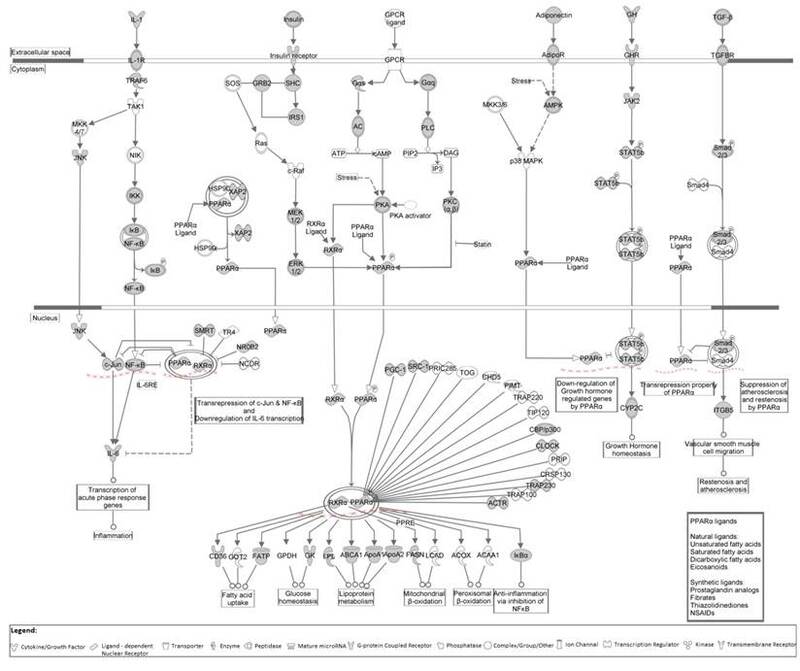 Canonical pathway PPARα/RXRα activation is representative at the cellular level (Figure 6) and depicts the involved genes/proteins, their interactions, and the cellular and metabolic reactions in which the pathway is involved. Grey colored molecules represent genes/proteins that appear in the dataset. To avoid miRNA genes that have a bias towards adipogenesis pathway as many of these miRNAs were isolated in studies using 3T3-L1 pre-adipocytes and adipocytes, IPA analysis was repeated with miRNA genes excluded. Interestingly, the same two central nodes were confirmed (data not shown). The centralized obesity database presented in this research will enable processing of collected data in various ways that will lead to faster development of obesity-associated molecular markers for functional studies in human and animals. Our study provides a basis for uncovering miRNA regulatory networks and identification of miRNA targets for combating obesity. For example, analysis of the obesity gene catalog with the miRNA SNiPer tool  revealed four human obesity-associated miRNAs (hsa-miR-96, hsa-miR-122-3p, hsa-miR-125a-5p, and hsa-miR-221-5p) that had polymorphisms within the mature miRNA seed region, which is responsible for target binding. Additionally, the central nodes of the molecular networks associated with lipid metabolism, such as PPARα and RXRα as well as genes and miRNAs that overlap with adipogenesis-associated QTL are strong candidates for further experimental validation. Potential obesity markers developed in the present study can help researchers in choosing the most promising biomarkers for further experiments. Canonical pathway PPARα/RXRα activation shown at the cellular level. 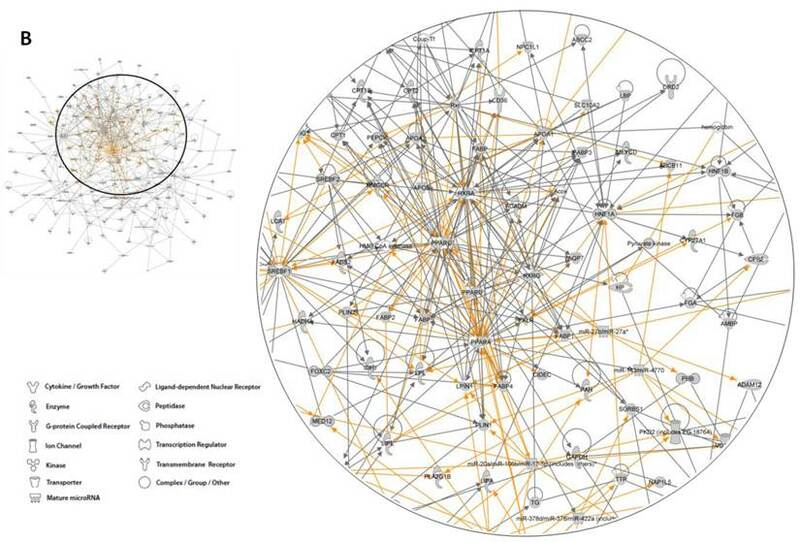 Grey colored molecules represent genes/proteins from our dataset. It is expected that the number of obesity-associated loci will increase; therefore there is also a need to develop new bioinformatics tools for collecting and presenting a large amount of obesity-associated information. An option for updating our central obesity database with new loci associated with fat deposition, including miRNAs and other non-coding RNA genes, and their regulatory mechanisms will allow development of novel biomarkers and will lead to better understanding and consequently more effective treatment and control of such obesity-related disorders both in humans and in animals. This study presents an integrated resource for obesity candidate genes and miRNAs potentially involved in obese phenotypes and currently includes 1,736 loci associated to obesity in four mammalian species. The centralized online obesity database collects dispersed data in a central location and aims to be an entry point for human and animal obesity research allowing users to retrieve and submit information, which is evaluated by curators. Systems biology approach will contribute to understanding of genetic causes for obesity and also presents a novel approach to study genetic background of complex traits. Table S1: Obesity associated miRNAs (54 human and 57 murine) with corresponding host genes. Table S2: List of 175 molecules included in lipid metabolism network. This work was supported by the Slovenian Research Agency (ARRS) through the Research programme Comparative genomics and genome biodiversity (P4-0220). Dr. Tanja Kunej is an assistant professor at the Department of Animal Science, Biotechnical Faculty, University of Ljubljana, Slovenia. Dr. Kunej is co-author of over 30 publications and has received two US patent awards. Her main research interest is integratomics in agriculture and biomedicine. Dasa Jevsinek Skok is a PhD student of Bioscience - Bioinformatics on Biotechnical Faculty, University of Ljubljana, Slovenia. She graduated from Animal Science at the same University. She is employed as a researcher at the Department of Animal Science, Unit for pig production. Her main research interests are bioinformatics and genetics. Minja Zorc is a PhD student of Biomedicine, University of Ljubljana, Slovenia. She graduated from Computer and information science at the same University. Her main research interest is integratomics. She is employed as a bioinformatics scientist at Rothamsted Research (BBSRC) Harpenden, UK. Ana Ogrinc is an MSc student of Biotechnology, University of Ljubljana, Slovenia. She graduated from Biotechnology at the same University. Jennifer J. Michal is an Associate in Research in the Department of Animal Sciences at Washington State University. She received her M.S. in Animal Sciences from the same University. She is co-author of over 40 publications. Dr. Milena Kovac is a Professor at the Department of Animal Science, Unit for pig production, Biotechnical Faculty, University of Ljubljana, Slovenia. Dr. Kovac's main research interests are statistical methods and software development for genetic evaluation in livestock (PEST, PeRun, VCE), applications of genetic evaluation in livestock, pig breeding and husbandry. Corresponding authors: Dr. T. Kunej, Department of Animal Science, Biotechnical Faculty, University of Ljubljana, Domzale, Slovenia, Tel: +386 13203890; FAX: +386 17241005; E-mail address: tanja.kunejuni-lj.si and Prof. Zhihua Jiang, Department of Animal Sciences, Washington State University, Pullman, Washington 99164-6351, E-mail address: jiangzedu.